Margaret Morrissey, Director of the Jacob Edwards Library in Southbridge and Wesley Stanhope, Adjunct Faculty at Mount Wachusett Community College, presented a history of the origins of St. Patrick’s Day and how the history continues to be celebrated today. The history was accompanied by a slide presentation of the beautiful country of Ireland. Past District Governor Klaus Hachfeld inducted Past-President Larry Mandell as a Paul Harris Fellow. 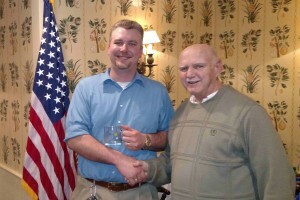 Larry served as president for two years guiding the Club through the Visioning Program. 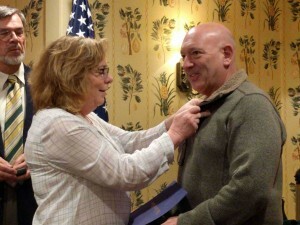 Larry’s wife, Mary, is shown affixing the Paul Harris Fellow (PHF) pin. 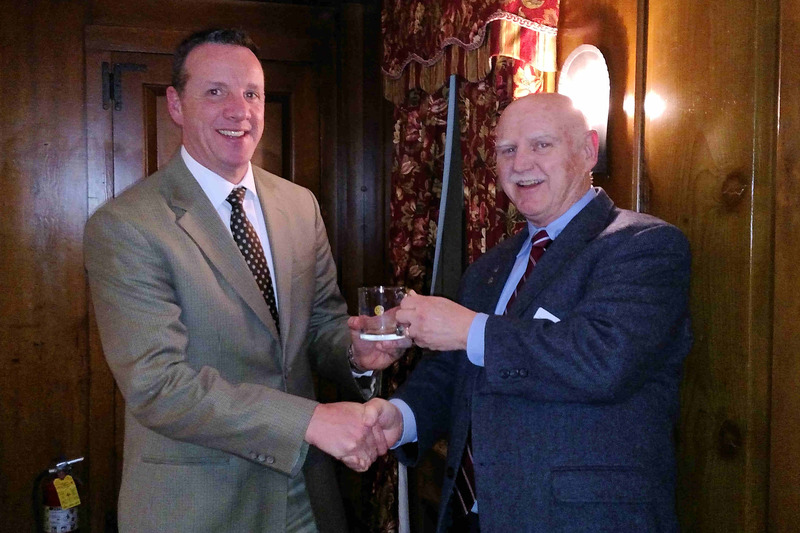 The Club now has 61 Paul Harris Fellows with many of the recipients having multiple PHF recognitions. 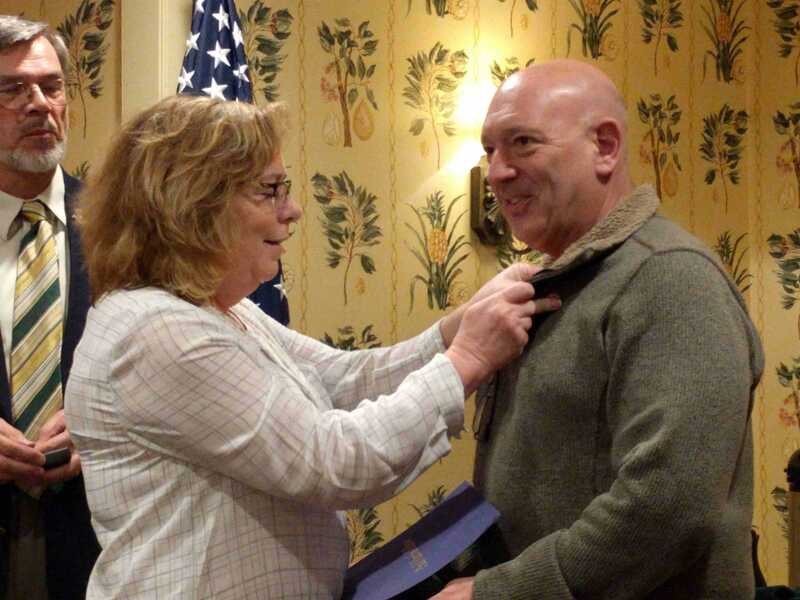 Dino Tata, a founding member of the Sturbridge Rotary Club, gave a fascinating presentation on NASA’s “New Horizon” Mission: “10 Years to Pluto”. 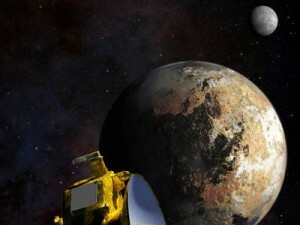 Pluto is the first ice dwarf planet and its moons to be visited by a spacecraft. New Horizons will take a close look at Pluto and its moons to help us understand the icy worlds at the edge of our solar system, three billion miles from Earth, and gather the first detailed images ever obtained. The mission will then visit one or more Kuiper Belt Objects beyond Pluto. Dino is an Ambassador for NASA and explained the mission to us. The New Horizon spacecraft, the fastest rocket to operate in space, is no larger than a baby grand piano and lifted off into space on January 19, 2006. It took 9 ½ years to reach Pluto. In comparison, the Apollo Spacecraft took 3 days to get to the moon, whereas the New Horizon rocket would only take 9 ½ hours to go the same distance. Glen Juchno from the Tri-Community YMCA spoke with us about three of the many programs offered at the “Y” in Southbridge. The first is Camp Foskett where kids create a “Lifetime of Memories” throughout the summer. Next is the Day Care Program which has seen tremendous growth over the years and is a very important component of the “Y” and a critical service provided to families. Lastly, Glen spoke about “Livestrong at the YMCA”. Livestrong is a 12-week program for cancer survivors who get support during their transition from completing their cancer treatment to feeling physically and emotionally strong enough to return to their normal, or new normal, life. All great programs vital to keeping the citizens and families in our communities healthy and strong. 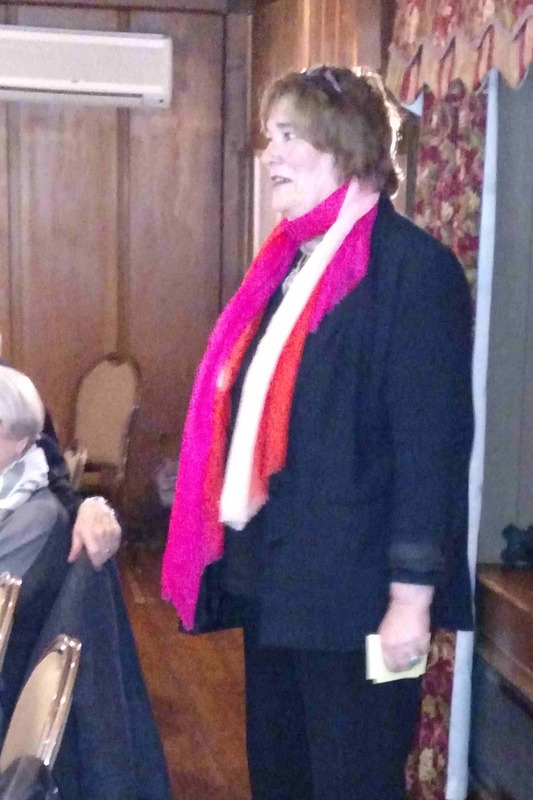 Julie Prohaska, Executive Director of the Quinebaug Valley Council for the Arts and Humanities (QVCAH), gave a very enlightening presentation on the QVC Arts Center, a local treasure in Southbridge. We learned all about the Arts Center and the many venues it offers to the children and adults of the 25 communities it serves. There is a full schedule of Gallery Shows, Art Classes, and Festivals and Art Sales taking place all year. 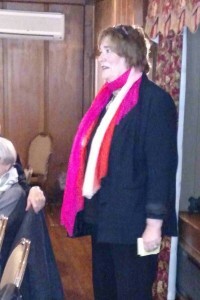 We were all invited to the VIP Opening of the Marion A. Kolbe Exhibit featuring her abstract expressionist paintings. Learn more about QVCAH by visiting their website at QVCAH.org. Maurice Poirier of Sturbridge and a long-time community volunteer was welcomed to membership in Sturbridge Rotary. Re-joining Rotary is Scott Peckins of East Brookfield. Peckins is the Executive Director of Camping Services at Camp Frank A. Day in East Brookfield which is operated by the West Suburban YMCA of Newton. 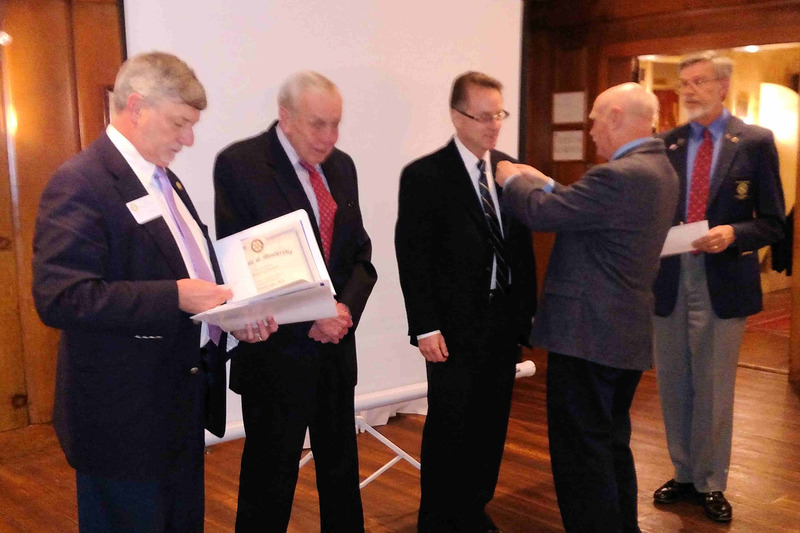 Inducting both members is Past District Governor Carl Kaliszewski (far left), Poirier, Peckins, and Past District Governor Klaus Hachfeld (far right). President Austin Jenkins pins the new members. 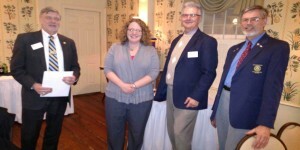 Kristin Morales-Lemieux of Brimfield was welcomed recently as a member of the Club. Kristin is Vice President / COO of Harrington Physician Services, part of Harrington HealthCare System. Presiding over the induction ceremony was Past District Governor Carl Kaliszewski (far left), Kristin, President Elect Otto Prohaska (second from right) and Past District Governor Klaus Hachfeld (far right). The members of Sturbridge Rotary are proud to have Kristin join them.